When NASA was looking for alternative capabilities for a launch vehicle to loft payloads into space and then return, several companies stepped up to the plate. Unlike the Space Shuttle, these new vehicles would not require expendible boosters or fuel tanks to get the vehicle aloft. McDonnell Douglas not only created such a capability, they flew it! If you've ever seen test footage of this thing flying around in its early test flights, it was the stuff that would have brought out the Roswell crowds. These early test vehicles were designed to test the engineering issues associated with taking off and landing vertically. It works great in the sci-fi movies, but it had never been done before in real life. 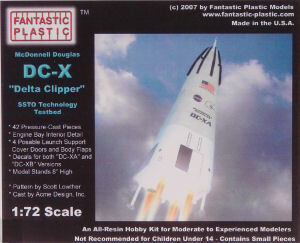 DC-X demonstrated the feasibility, but was never flown into orbit for a full-cycle test. Instead, the test vehicle had a landing gear failure and toppled over on landing. Rather than building on success, NASA instead ended up funding Lockheed's ambitious design that never got past its fuel cell problems and NEVER flew. After loads of money went down that pit, we're still flying the Shuttle - and not for much longer. What do we have in its place? Expendible launch vehicles. Go figure. I've seen some interesting subjects released by Fantastic Plastic in the past, but this one is of particular interest enough to buy my first kit from this company. I ordered the kit directly from their website and a short time later, my kit arrived in the mail. 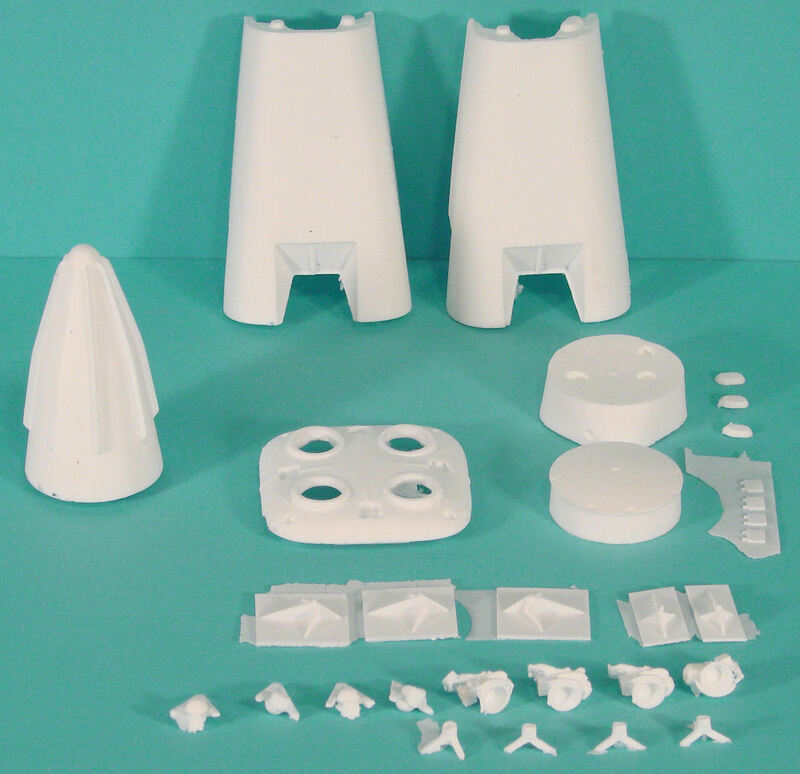 The kit is cast in white resin and will require some experience with limited run resin kits to assemble (as it clearly states on the box and website). Nevertheless, this isn't a complex project and will go together rather quickly with the right tools and experience. The landing gear struts are provided using styrene rod (not shown in this photo) but I will likely replace these with brass rod to avoid a gear collapse of my own. 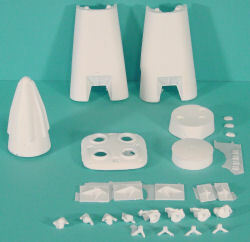 Even though the main fuselage is hollow-cast, the parts are thick and the resulting assembly will be on the heavy side. I'll go with brass landing gear legs. The kit provides the option for the side access panels to be displayed open, revealing the engines mounted to the underside of the hydrogen tank and the airframe support structure. Two sets of markings are supplied, one for DC-XA and the other for DC-XB..